TODAY’S THOUGHTS FROM THE CORNER: Introducing KATRINE STOREBO…. artists, pick up your art…. wine thief, we know who you are…. mystery painting, we don’t know who’s you are…. 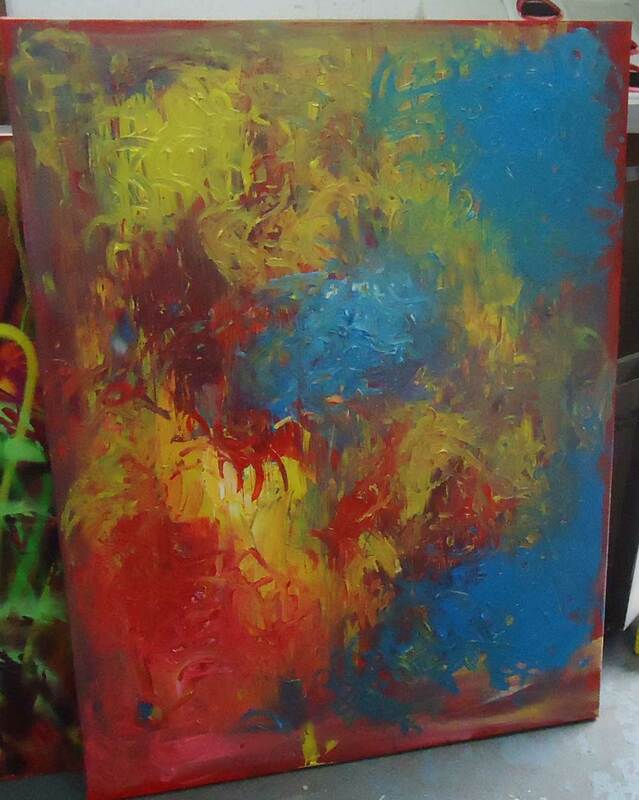 “My paintings express the energy and magic a moment holds through the use of bright colours and quick brushstrokes. They contain a sense of nostalgia with a focus on spontaneity and playfulness. As a source of reference and inspiration I use old photographs and film stills to recreate moments and reveal the wonder behind what might seem insignificant and mundane. I am fascinated by blurry references, such as holiday snapshots damaged by the sun where all that is left are shapes of light and darkness which more easily express the atmosphere and mood. A few parish notices while we’re here…. ARTISTS, PLEASE COLLECT YOUR ART. 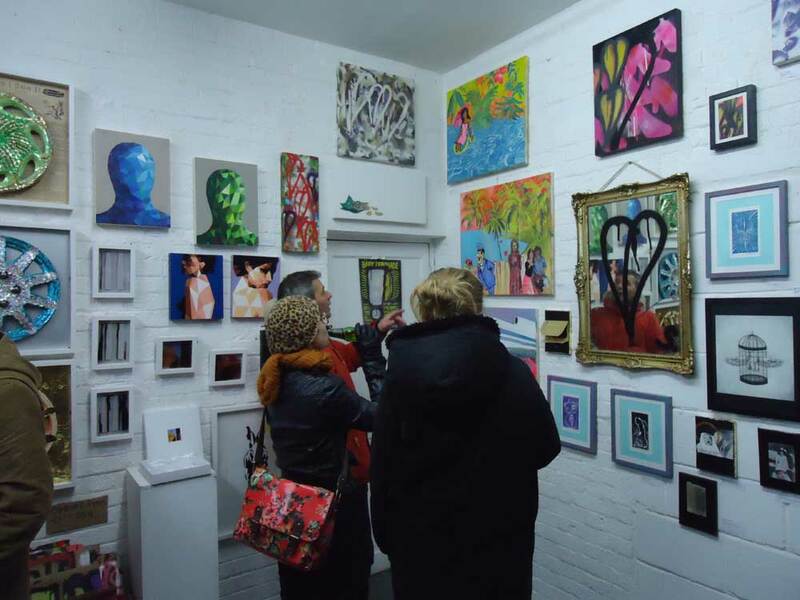 By now you artists should have all clued in to the fact the gallery space comes to an end at 5pm on Sunday December 8th. The space is maybe closing, maybe evolving, see previous blog for notions of art chutes and such. We’ve been telling you artists every time you join in a show that we have no storage and art has to be picked up promptly at the end of the show you are taking part in. Alas that has not stopped some of you leaving your precious art (I assume it is precious to you?) with us for months and months, and in some cases, despite our constant personal messages and such asking you to collect it, over two years (like this bloody big sculpture in this great big box that has been right here under my feet in my studio, since late 2011). Artists, you have been warned lots of times, we’ve sent you direct messages, we’ve said on line, we’ve said in the show info we send you when you submit your work, we are saying it again here for all to see. Art must be picked up. 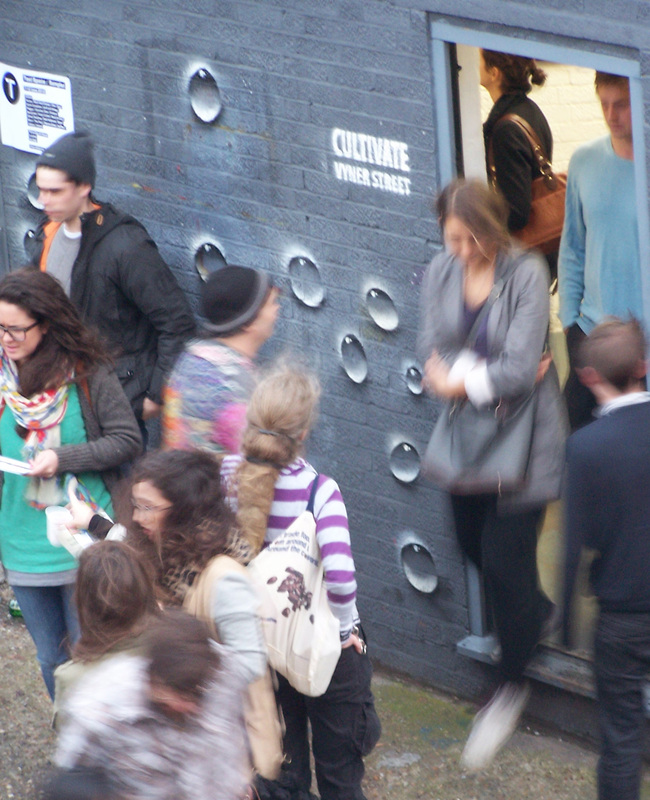 The ongoing evolution of an artist-run art space down an East London street. So we’re currently enjoying the last show in the space before it evolves. I’ve lost count of the number of shows now, eighty or so I think? 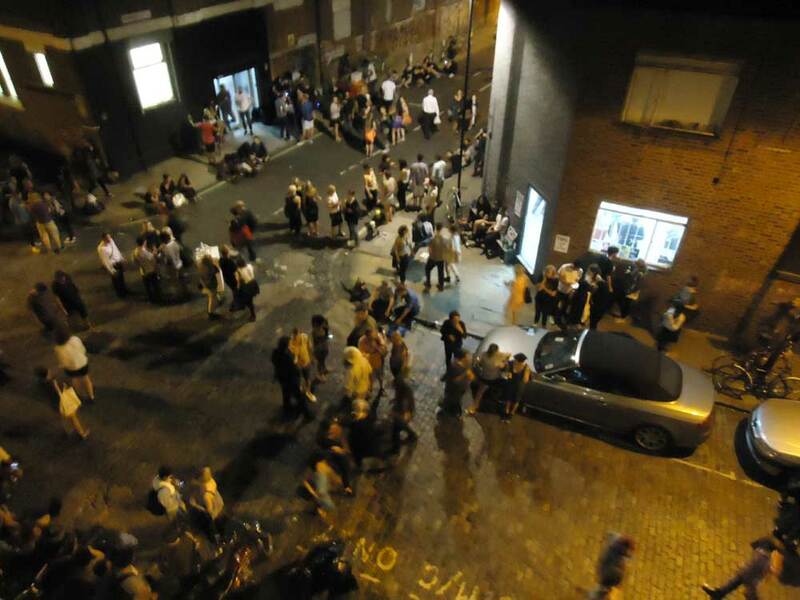 No idea how many artists, hundreds in the two and a bit non-stop years of Cultivate existing and happening on our corner in ever changing Vyner Street. And so we’re in to the final stretch, the last group show (and the ongoing battle to pay the rent). Art is For Life, Not Just Christmas opened last Thursday, thanks to everyone who braved the cold and showed up for the opening, I think we can claim it was a good night, I hear reports of hangovers on the morning after the night before, and I certainly had a healthy mess to clean up on Friday morning. Big thanks everyone, always good to see people, show the art and socialise at an opening, always good to sell a piece or two of art as well, and as this is Vyner Street, there’s always other things happening in other spaces along the street – that’s the thing about this street, even though some of the galleries choose to hide behind their signless closed doors, there’s always something going on. Last Thursday evening it was the combined open doors of Cultivate and Wayward fusing together, do love wintertime openings, far more atmosphere and warmth. Although I must say I haven’t got a lot or warmth to share with the person who helped himself to a full bottle of wine as he left – you know the score, I know who you are, this is an artist-run space, and we’re not talking trust-fund artists here either, there’s some serious sacrifice and commitment gone in to this space, there’s a principle here. Have to say here that we were a little dismayed to look in the gallery donation tin on Friday morning aswell – we haven’t got a sponsorhip situation going on here, we haven’t got a mountain of Japanese lager to dish out free like that lot down the street. I put my hand on my own pocket for those cases of “free” beer and questionable wine, I know cheap bottles of larger and bottles of supermarket red aren’t the height or indulgence, but I was expecting to find a little more than a splattering of copper and small denomination silver in the tin. Told you before, we’re skint, don’t be drinking all our beer and making off with our (admittedly cheap) wine without at least making something near a reasonable donation – hey, come on, don’t take the proverbial! AND you artists still have time to get you art of the walls for the current Art Is For Life show, get your art on show (and on sale) for the next two weekends and December First Thursday, see yesterday’s blog for more details. THE MYSTERY OF THE WET PAINTING. Last Saturday evening, just after I had locked up Cultivate, somewhere around 6.30pm. I found a painting. There it was, just lying there in the middle of the road, a substantial canvas, lying there face down on the cobbles in the orange streetlight, waiting for the next vehicle along to crush it. Now those of you who know my artistic practices, will know there’s nothing I like more than finding an abandoned piece of unresolved art in a skip and recycling at least the canvas, if not the marks, so my first though was jackpot. Hang on though, what is this doing in the middle of the street? This hasn’t been thrown away, there’s no indication that it might be some kind of Free Art Friday (on a Saturday) gesture, and wait a minute, this is still (very) wet! So no sign of life anywhere in the street, no lights on in any of the work spaces or galleries, no obvious sign of where the recently painted canvas might have escaped from. So, took said wet canvas back to Cultivate, locked it in, wrote a big note and stuck it on the wall explaining where it was should anyone be looking, and went off home. Asked around the spaces and studios that were open on Sunday, no one laid claim to it, no one shed any light on the now not so wet painting. So right now said piece of work is in Cultivate, if it stays around for too long then chances are a layer of leaf shapes are going to grow on the colourful textures – looks like an interesting set of colours and textures to paint on actually, but I do rather suspect this is something that hasn’t been deliberately abandoned though? 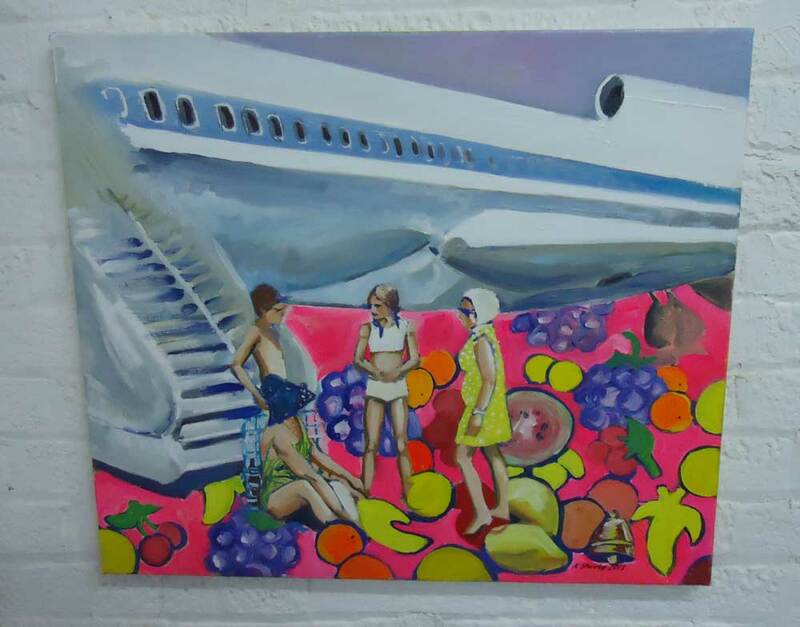 Anyone working in the Vyner Street area on Saturday lost a freshly painted canvas about one metre square? 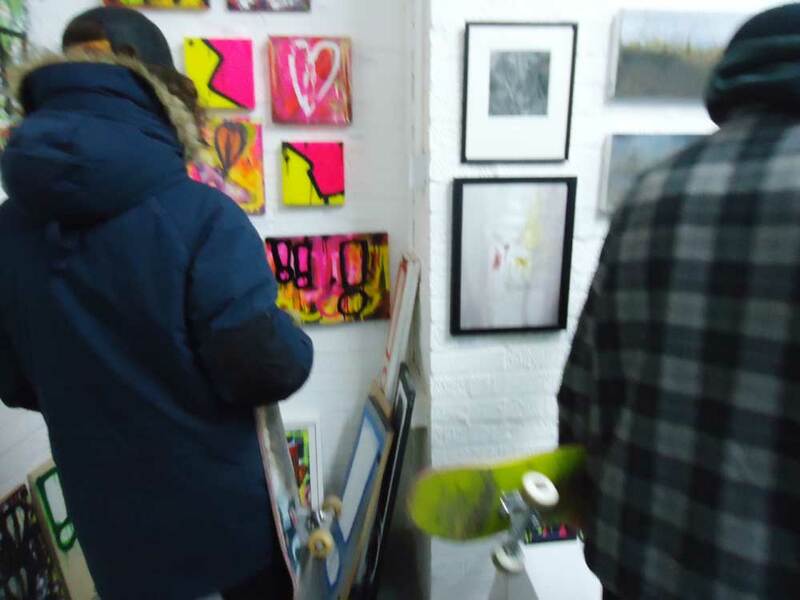 ART IS FOR LIFE, THE SHOW SO FAR, AFFORDABLE ART, TAKING PART, NOT JUST FOR…. 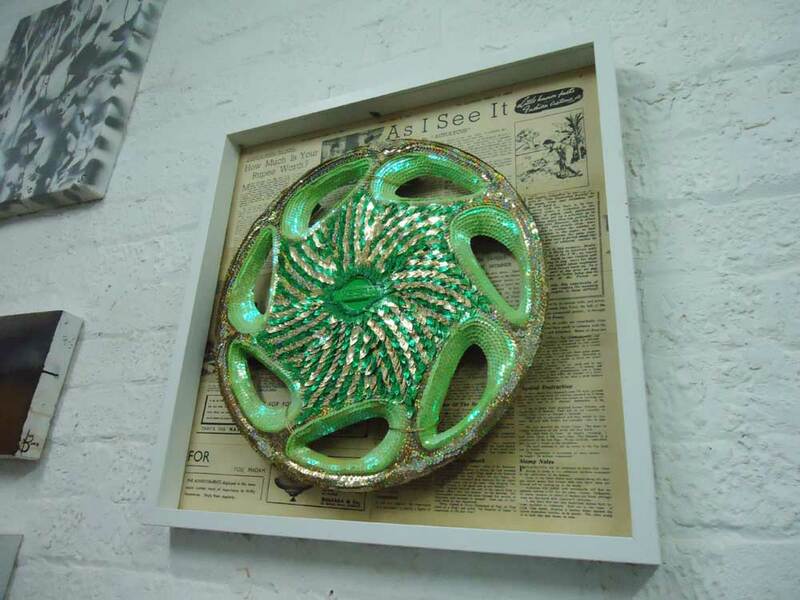 ← ART IS FOR LIFE, THE SHOW SO FAR, AFFORDABLE ART, TAKING PART, NOT JUST FOR….